The Dog Who Wouldn't Be by Farley Mowat, Michael Joseph, London, 1958. Last summer in Michigan, I bought an old hardback copy of Owls in the Family and read it aloud. The children ate up the story about Mowat's wild pets in Saskatoon, no doubt helped by the wilderness setting in which we were hiking and kayaking with their grandmother. It reminded me of when, as a child, I saw a TV show inspired by Never Cry Wolf and wrote an angry, illegible letter to my congressman about the plight of the wolves. Over the years, I have read a fair amount of Mowat's work, since I love survival-literature. I particularly remember his coverage of the case of an Inuit woman who killed her two children to prevent them starving to death -- she was later rescued and tried. Most recently I had read The Boat Who Wouldn't Float , about some months he spent sailing around Newfoundland. It is full of great stories of living on a boat with his dog and girlfriend, alone in a lagoon. There are bits of adventure (booze smuggling) and pathos (a man and his young son, moored next to Mowat, leave port early, and after a storm are never seen again). It seemed like a good time to read some more by this author. I recently revisited Fisher and Sperr used books in Highgate. I had been there years before, led by Book Lovers' London, and, though the shop was darker and sourer-smelling than I remembered, I swear I recognised most of the books: the huge London section, the Heritage Press slipcases. Finally, after getting the basement light turned on, I spotted this copy of TDWWB for £2.50. 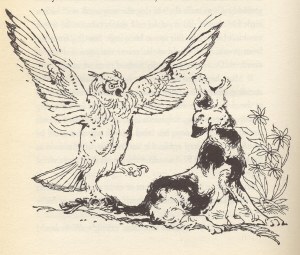 A Note from the Author: Were Wol and Weeps real owls? Of course they were! And Mutt and Rex and Murray and Bruce and I were real. And if you should happen to be going to Saskatoon in the spring of the year, and if you should happen to take a walk across the prairie, it wouldn't surprise me in the least if you happened to meet some of us. And if it's a big white owl and a not-so-big brown owl you meet -- give them my love, will you? I tried to inoculate myself, in the dank basement of Fisher and Sperr, by reading the last bit of TDWWB by the light of the sidewalk grating. It did no good. First you learn the real, sadly ironic fate of Wol, and then there are two elegiac pages about the end of Mutt. I am afraid that I gurgled and puffed alarmingly on the Piccadilly line as I finished the book, and I had to pull out The Economist and settle behind it to calm down. P has been surreptitious lately. She minimises web pages when anybody walks into the room, and otherwise exhibits the guilty mannerisms of someone who is...surfing for dogs. First it was labradoodles, until we spent a day driving hundreds of miles to see breeders, and she realised how big they are. Now it is lurchers, which are greyhound/mutt crosses. I do not want a dog, but maybe I should up the ante and say we can have one if we move onboard a sailboat. All I would need is a corrosion-resistant, brass-bound computer. If nothing else, Mowat's works make you want to spend more time outdoors. Susan wrote: Did you know that Mowat had been denied entry to the US as "undesirable"? The movie of Never Cry Wolf is fun -- the children would enjoy it too. Speaking of being in the wilds but taking it a bit too far...we saw Grizzly Man . Paul gave up after an hour and I much appreciated the decision not to air the final audio (scream, crunch, silence I assume).